While trekking from teahouse to teahouse has been our life for the better part of the last forty days in exile, our other life has been navigating the cities of a quickly developing, though not yet thoroughly modern, Nepali culture. Since I haven’t spent any significant time in developing countries and I’m still pretty amazed when people load five 50lb bags of rice on the local bus or don’t hold onto their child when he’s hanging out the door of a bus on a cliffside, I thought I’d focus my observations here. 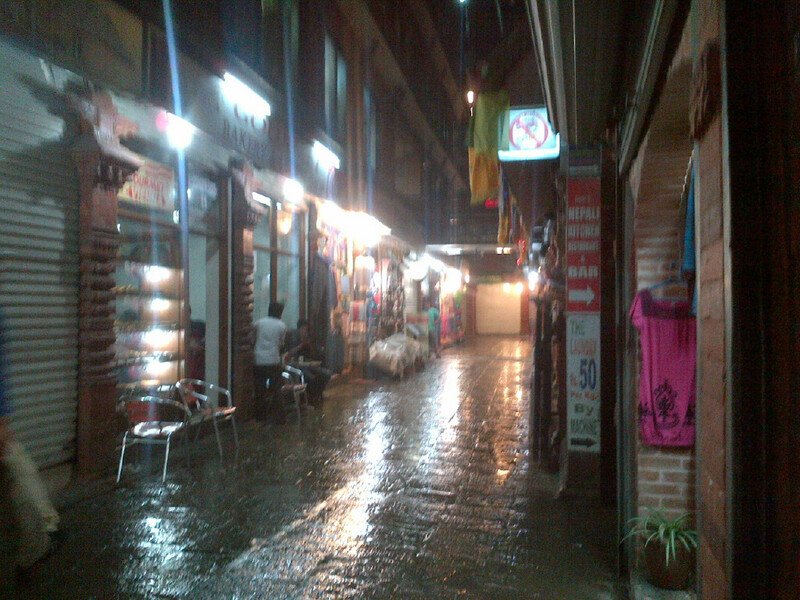 Kathmandu feels like a cross between Blade Runner and Juarez. As soon as I landed, the city of Kathmandu itself was a blur. TaxiTaxiTaxi. RupeeRupeeRupee. Motorcycles. Scooters. Tiny non-Ben-and-Rich-sized cabs. Potholes the size of those cabs. Dodgy old samosa stands. Juice-box-eating cows. Honking. Lots and lots of honking. At least the phony beggars, drug dealers, and excrement on the street felt like home in the Haight. 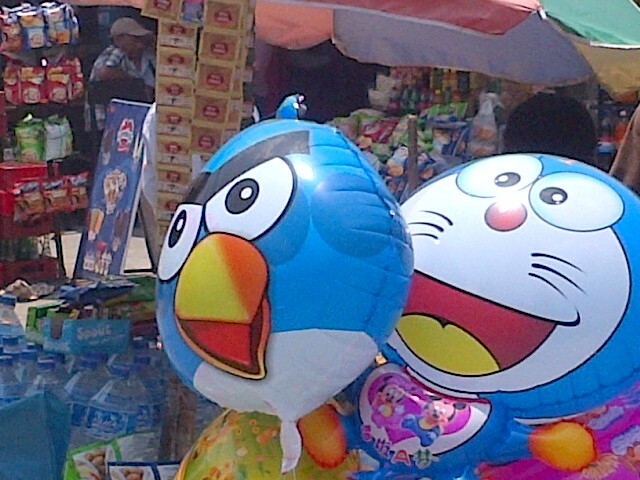 And, oh, all the Angry Birds. It wasn’t just Kathmandu. We went to Pokhara and saw the same souvenir stands, counted the same children with red birds and black birds and birds whose colors don’t exist in any of the Angry Birds games I know. We traveled to Besi Sahar to start the Annapurna Circuit, 8 hours from Kathmandu or Pokhara by bus, and the kids were wearing the same thing. The only thing I can compare it to is that moment in 1989 and 1990 when every child in America wore either a Batman or Bart Simpson t-shirt. And that makes me feel old, since half of the folks we’ve met here were probably born after then. What’s that I see on a kid here in Besi Sahar? A green pig! Yes, that’s what’s been missing for me here in Nepal. While Angry Birds clothing and toys in the US often include the evil greedy egg-stealing pigs, here in Nepal all you see are the birds, angry for no reason at all. I started to wonder why the hell Angry Birds is so popular everywhere (besides, you know, the obvious fact that phones are subsidized computers and mobile games are cheap, blah, blah, blah). It’s perfectly clear to me that, unlike All-American Mickey, Angry Birds strikes a chord because it’s a thinly veiled metaphor for the rising up of developing countries against the Western industrialized nations stealing all their ****ing eggs. I’m not even close to being the first person to connect our green piggy villains as greedy natural resource plundering capitalists (and royalists) or see our plucky (but not plucked) heroes as angry red communist birds. See here for one example from non-comprehensive googling. Yet it does ring true, and besides the communist red birds, this **** is racist. Yellow birds who karate chop through wood? Violent black birds who explode? Fat white drone-like birds who drop bombs from the air and then run away back to DC? And clearly, our Northern European / Western-apologist game designer saw fit to include the silly blue socialist bird who splits into three smaller birds (clearly representing Norway, Sweden, and Finland) and are only effective against ice. Great Rovio, thanks for including that one. 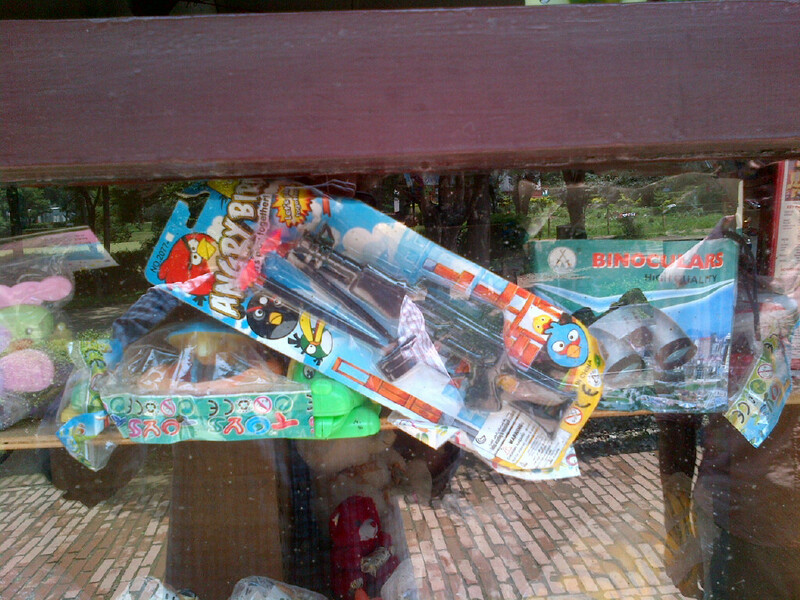 But I digress… Angry Birds is a cultural phenomenon in Nepal. And some of you may be lucky enough to receive authentic, unlicensed, Nepali-woven Angry Birds hats to wear this winter (or as we call it in San Francisco, July). 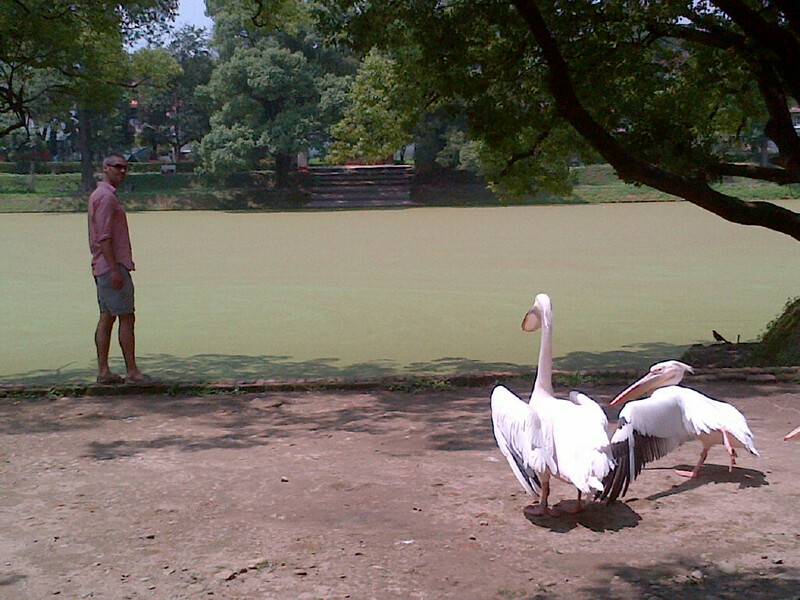 Richard and the real Angry Birds of Nepal–giant pelicans at the zoo. 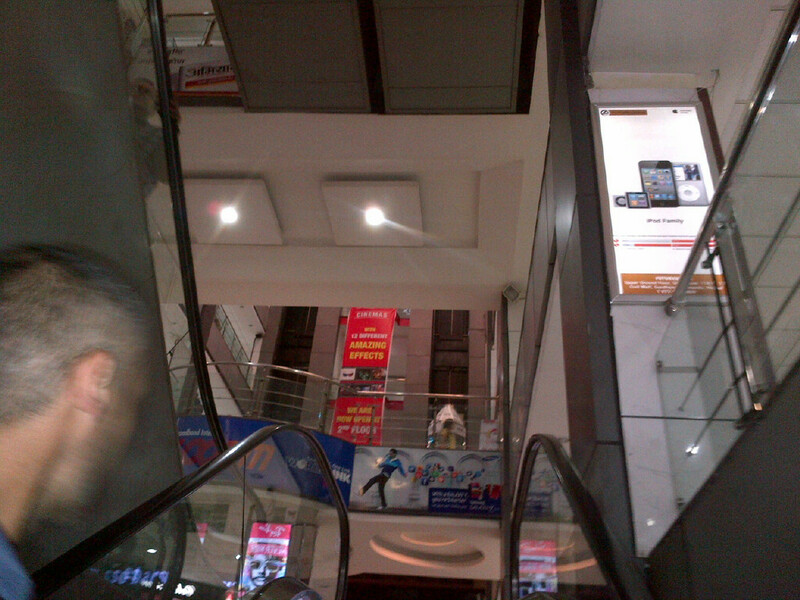 This week we took a little trip to the Kathmandu Civil Mall. AND IT WAS THE BEST TRIP EVER. We wanted to do something different from Buddhist-this and stupa-that, and I personally wanted to see what it was like to see a movie in Nepal–and, more importantly, what kind of snacks they sell. 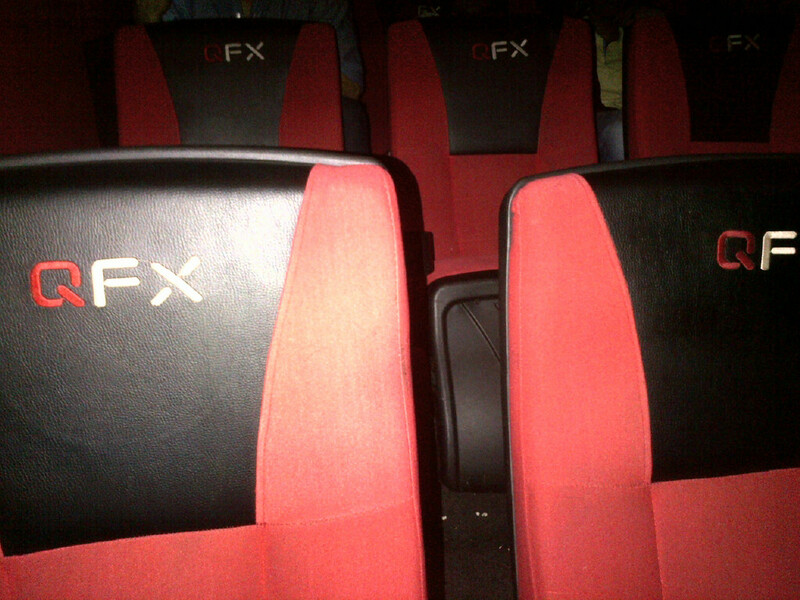 One click later from my phone to the QFX Cinemas website, and we were on our way to see the latest US sensation Fast & Furious 6. Outside to the muddy, pothole-strewn streets. “Civil Mall. Civil Mall. Kantipath. Sundhara. Sundhara. How much?” “400 rupees,” the first cabbie replied. “200?” “300.” “No, no.” Next cab. “Sundhara. Civil Mall. Civil Mall.” God forbid we were trying to win the Amazing Race and looking to save 50 rupees. “300 rupees.” “250?” Done. We’re on our way now down Tridevi Marg to Kantipath (most streets don’t have names here), four people in a tiny Suzuki hatchback, locking the door to prevent one of us falling out in a collision with a scooter driver wearing no helmet but definitely an Angry Birds shirt. I can’t explain how exciting it is to reach the relative gleaming building that is the Civil Mall. Kathmandu is a mixture of old and new construction, all jumbled together and put together with glue and popsicle sticks. The Civil Mall, though, is a bit of an exception just because of its size–they knocked down whatever was here, and no one has yet attached a metal shack to its side. Plus the army base and park are across the street, making it seem somewhat like an oasis of modernity. All of us have been trekking for a decent period of time, Rich and I the longest, and while we’ve had little luxuries sometimes like wifi and warm bucket showers and toilet paper, nothing can prepare us for the sensory overload as we step inside the Civil Mall. Escalators are a welcome respite from climbing uphill. 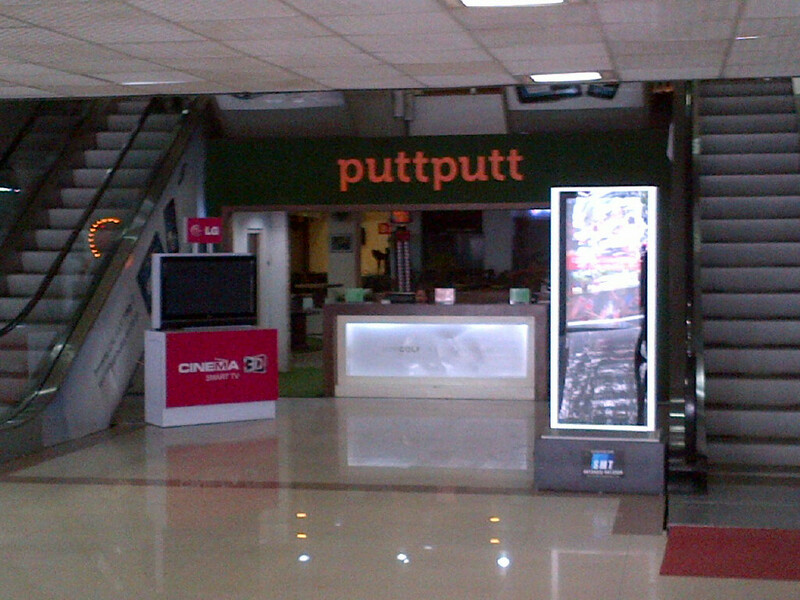 Putt Putt is officially one of the loneliest things one can do when traveling by oneself. Luckily, not the case this time. Our friends are staring up at 8, 9, who knows how many, floors of pure commercialism. And what’s this? 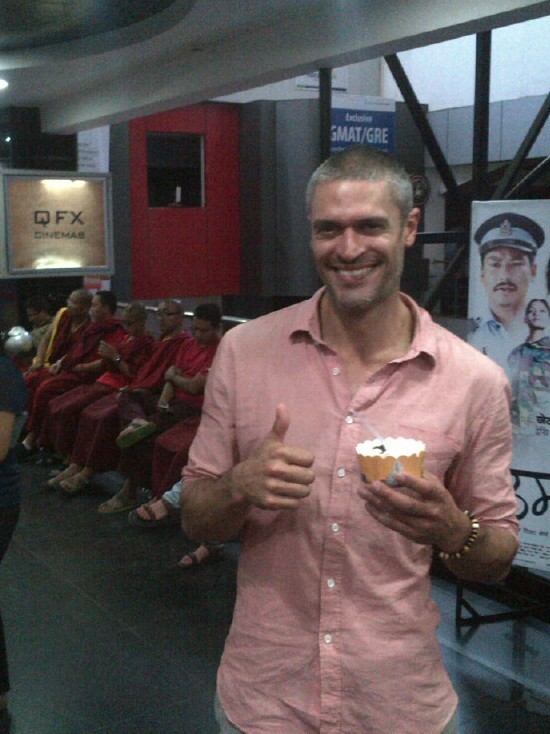 It’s Nepal’s first frozen yogurt stand. Pay by the gram. 155 rupees for vanilla, blackberry, and toppings. What’s over there? It’s a frickin’ bowling alley and arcade and a food court and a Vans store. And no one’s wearing Angry Birds shirts. Because Kathmandu’s coolest twenty and thirtysomethings are packing in for a really awesome Monday night out at the movies. We get in line behind 10 Buddhist monks for tickets to see Fast and Furious 6. Just call him “Zen” Diesel. The ticketing system is as good as the best movie theatres in the US–you can pick your own seats, and there are different levels. For 250 rupees apiece (the cheapest tier, “platinum”), we get tickets in row O on the aisle. We go through TSA-style pat downs, check a pack of cigarettes(?? ), and head on upstairs to the theaters. And while Fast & Furious 6 is a terribly great movie (or is that great, terrible movie? ), I never would have had this much fun in the US. The theater is packed. Everyone is laughing and clapping and sitting on the edge of their seats. There’s even intermission! Intermission is less about the theater selling snacks (again, reasonably priced) and more about showing even more advertisements and trailers to the packed audience. I think you can figure out a lot about a culture by how and what they advertise, how they phrase and show things, what products are popular, etc. If the unapologetic brand building here is any indication, things in Nepal are looking way up. Have you seen a commercial for a paint store in the last ten minutes… You know, like Sherwin Williams? Do you have a Sherwin Williams on your block? Do you have two Sherwin Williams and a Benjamin Moore on your block? Did you know Lewis Berger has been making paint since 1767? Do you even know who Lewis Berger is? For shame, I can’t believe you’ve answered “no” to all those questions. 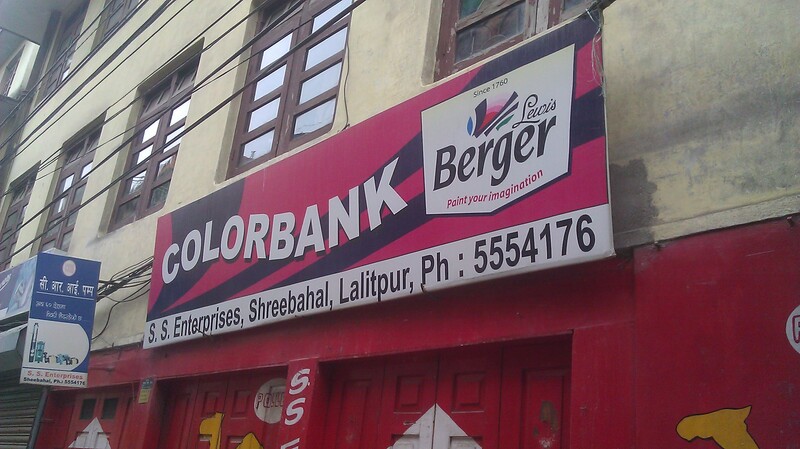 Because here in Nepal, I can go to any number of ColorBank or AsianPaints or PashupatiPaints stores in a three block radius (I’m a ColorBank man through and through). Paint stores are like Starbucks. Everyone is buying paint or selling paint or trading paint futures or developing collateralized paint obligations. Okay the last part’s not true, but there is clearly a construction boom. Even in towns which require every piece of a building to be carried by porters over 20 miles uphill both ways, there are two new lodges being built every year. Thank you, Jon Krakauer. In fact, in Kathmandu just since we arrived in April, a shiny new grocery store appeared across the street from our hotel with all kinds of ex-pat goodies. It also has some of the same qualities as the SF Marina Safeway, if you catch my drift. What’s one of the worst ideas for a commercial you can think of? Did you say people getting shot by a firing squad? See you’re just not thinking far enough outside the box like the folks at Micromax. Micromax’s intermission commercial involves a firing squad lined up to kill 10 people. The firing squad shoots. Everyone falls. And then you see that the squad was firing paintballs. And you can see the paint MUCH MORE CLEARLY with a MICROMAX powered camera than those on other inferior phones. WTF? Their tagline ends, “Nothing like anything.” Indeed, Micromax, that is nothing like anything I’ve seen. What’s the current interest rate on your checking account? Probably, like me, close to zero. Here in Nepal your checking account will gain up to 5% per year, and the banks are just hopping to take your deposits and loan it out. Our favorite bank commercials at intermission involved moving vignettes about financial instruments. For example, you’ve just bought one of these ramshackle buildings put together with popsicle sticks and glue, yet your wife dreams of decorating it with fancy Index Furniture (now open in Steel Tower and Metro Park). Or you take your granddaughter out to the Civil Mall where she sees a pair of designer jeans. You instead see the price tag of 5,000 rupees. (For what it’s worth, I’m not sure I own jeans worth 5,000 rupees.) The answer to all the vignettes is credit with one of the taglines being “Cash whenever you want.” This has never in the history of finance turned out badly. Also, for those of you who have taken money out of your US bank account and opened a Nepalese one after the last paragraph, please note that the US$/Nepalese Rupee exchange rate has gone in the US$ favor by 3% since we got here two months ago. Maybe that zero percent interest rate isn’t so bad. Do you remember in the movie Three Kings when Mark Wahlberg is asked in an interrogation, “What is the problem with Michael Jackson?” You know, because America has made him bleach his skin and mutilate his face. Well, thank you Western consumer packaged goods companies, because you can’t buy a moisturizer here that isn’t Extra Whitening. And every moisturizer commercial shows you how much whiter your skin can get after just seven days. One woman in a Ponds commercial is dressed up as a brunette Marilyn Monroe and tries to put a fake beauty mark on her face, but it keeps disappearing because she used Ponds earlier in the day. The best moisturizers go down twenty layers of skin deep. That’s a lot. I’m paler now than when I got here. 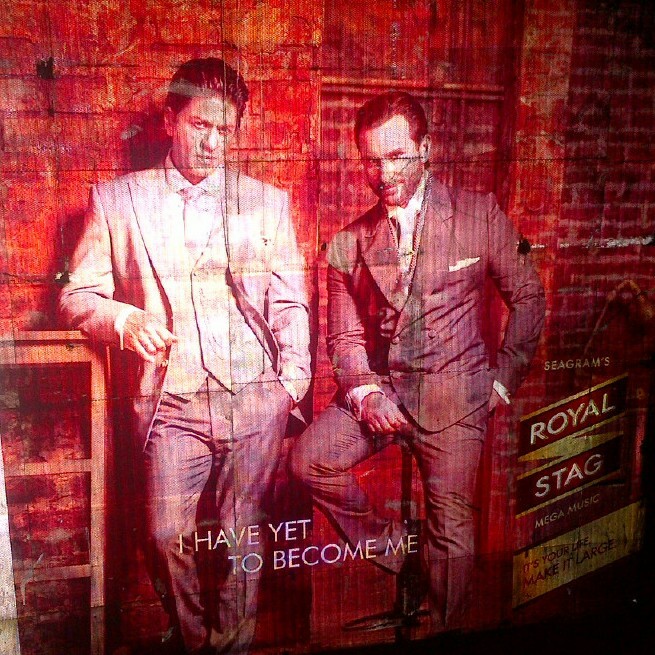 But the most important question to ask yourself after visiting Nepal, is “Have I made it large?” This is the question posed by Royal Stag Whiskey (a Seagrams brand) in a series of fantastic advertisements featuring Indian celebrities that are as omnipresent on the streets as Tiger Balm hawkers and potholes. It’s Your Life. Make It Large. The Indian knockoff version of Bradley Cooper has yet to become himself. Yes, I think that’s probably as good a sentiment I can find for Nepal right now in its development, as well as for these travels. Because if you’ve been following Richard’s blog posts on this Himalayan adventure, the answer to “Have we made it large?” is undoubtedly yes. Time to find the swimming pool. This entry was posted in Nepal, Uncategorized by Richard. Bookmark the permalink. You two are such different writers. Dickie writes for National Geographic. Mino writes for The New Yorker. And Mini Calves writes for… I’m not sure. Second City? Hugs all around.